The bad news is that today I have a sick kid at home, so I have to focus on her, and not all of you. 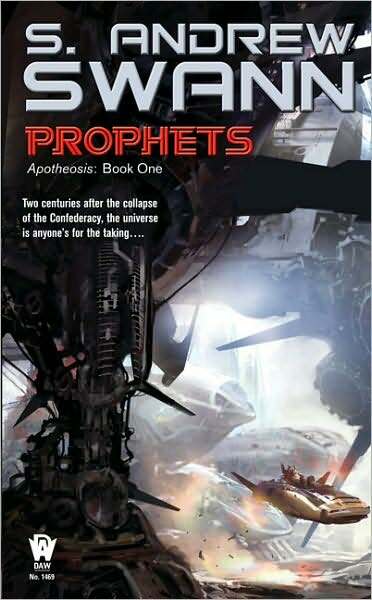 The good news is that in my absence, you get a Big Idea piece, this time from S. Andrew Swann, talking about Prophets, the first book in his new science fiction trilogy. See? Even when I’m away, I’m still thinking of you, and giving you quality amusement, even when (indeed, especially when) it’s actually someone else doing all the heavy lifting, amusement-wise. Take it away, S. Andrew Swann! Sometimes it’s a flash of inspiration, whole and complete. Sometimes it’s a laborious process of methodical development. And sometimes it just sits in the dark, growing larger when you aren’t really looking at it. . .
Tracing the impulse behind Prophets, and the trilogy it begins, inevitably leads to the prior set of books in that universe. I wrote the Hostile Takeover Trilogy nearly fifteen years ago, and my main goal was to write about a realistic anarchy. However, because my planet Bakunin needed a universe to inhabit, I spent a lot of time and effort developing the background of my libertarian-nior space opera. One of the issues I needed to address was how to write an old-school space opera, with all the neat gadgets and stuff, without dealing with some of the more outré elements of what everyone calls now the technological singularity. Now, I could have just ignored the issue and written it the way I wanted even if I didn’t think it was plausible that with the all the technological gee-whiz elements I threw in, the universe I wore about was in some sense, technologically retarded. But that would have bugged me, so I took another route and gave my future star-spanning human culture(s) a moral aversion (with good reason) to three specific technological developments; artificial intelligence, genetic engineering of sapient life-forms, and, most importantly, a complete and utter ban on self-replicating nanomachines. Using that old sfnal standby, I got my tech behaving the way I wanted, and I got the added bonus of having a few characters who’re remnants of all three “heretical technologies.” They got to add color and backstory, they didn’t alter the balance of power- at least not in any way I can mention in a non-spoilery fashion. I really liked the universe I set up in those books, and given how I ended it, any direct sequel would have seemed anti-climatic. So, for a long time it seemed that the story of the Hostile Takeover universe had reached an end. All the characters had walked offstage, their journeys complete. But the universe itself continued to nag at me. The arc of each character had been completed, but in the back of my mind the arc of the universe wasn’t. For a long time there were a number of questions that lurked in the darkness. I’ve always tried hard to fully develop the implications of whatever premise I’m working from- it’s why my stateless planet Bakunin looks more like Somalia with venture capital than a libertarian utopia- so leaving that particular thread dangling eventually prompted me to write a sequel. Once I started writing Prophets, I opened a whole new can of worms. Not just about the frictions of a technological asymmetries, but about the frictions of moral asymmetries. The more I looked at the issue of change coming to my universe, in the form of a long-deferred singularity, the more apocalyptic things became. And not just apocalyptic in a metaphorical sense. Because my world had taken a moral stand against this technology, the bringer of these advances can be seen as the devil. The singularity becomes, in most meaningful senses of the term, “the end of the world.” And the idea of the singularity as “the rapture for nerds” becomes less of a joke. Of course, you can’t have a apocalypse without religion, so this influenced the background and characters. The main protagonists turned out to be a Jesuit priest and a genetically-engineered tiger that follows a form of puritan gnosticism (what’s your view of God when your creator is such a fallible being as man? ), the MacGuffin in Prophets is the transmission of a verse from Revelations coming from the vicinity of Xi Virginis, and the main political actors in the novel are the Catholic Church and the Eridani Caliphate. All of this played into another long-standing fascination of mine, speculative religion. I’ve been working on alternative moral frameworks for my characters for years, building belief systems that grow logically from some fundamentally different premises. Prophets, and the books that follow, gave me a chance to stretch those muscles in what I think were some interesting directions. It also gave me a chance to unload all the cool space opera ideas I’ve been sitting on for the past decade or so. Visit the Prophets Web page. Visit S. Andrew Swann’s blog. I’ll be sending you Positive Dad Vibes, from one Dad to another. Nice thing is, you work from home anyway. Hope you don’t get it too. Well, you convinced me. I just bought the Hostile Takeover trilogy via Amazon. If I like it, I’ll see about buying Prophets. Swann certainly knows how to write. I ran into him via “The Best of Jim Baen’s Universe (http://www.webscription.net/p-607-the-best-of-jim-baens-universe.aspx) and was astonished at how much punch he could pack into a short story. I’ve gotten “Prophets” and it’s in my queue. Gah – just peaked my interest with this book, and then I go off to look after it on Audible, and find that it’s not available. Now I’m all sad. I guess I’ll just wait for it to come out then. Wow, John – I hope Athena gets better soon! She’s all right — just a bit of a cold. She’s resting and watching Powerpuff Girls on DVD. Clearly I’m not the only one who raced straight to Amazon and found the Hostile Takeover trilogy. Two left, I bought one, and when I refreshed the page, none left! I’ve always found it a bit disconcerting that various science fiction, such as Star Trek, tend to ignore the genetic engineering and AI aspects of transhumanism. 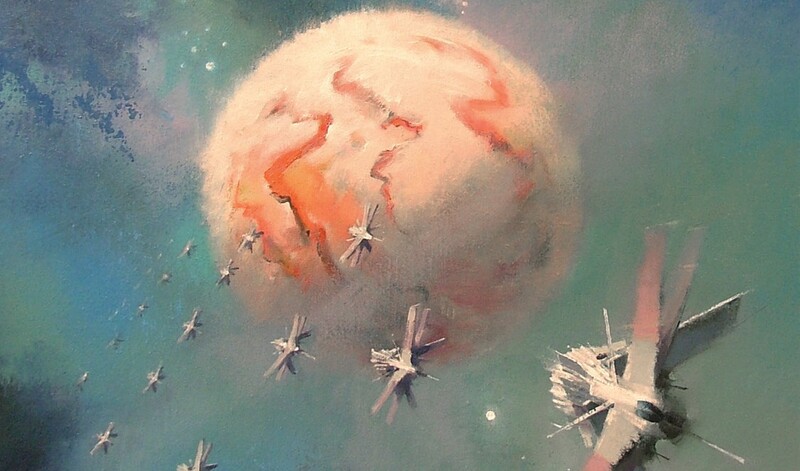 IMO, these concepts are underrepresented in science fiction, particularly space opera. Ergo, the idea of dealing with them in a space opera context is highly intriguing to me. I’ll be checking out this book when I have free time. I normally try to avoid Big Idea posts – and I’ve been trying to avoid buying new books this week but this may just have made that impossible. As the father of a 6 and a half year old daughter I have to support the usage of Power Puff girls in situations like this. The description of this novel really has my interest. Thanks. Well I went and bought the ebook at Fictionwise. He had me at the word Bakunin. I read the other ones and liked them so I had to get this one. The only weird thing is that because I had some credit there (not enough to get the book) it turned out about a buck cheaper for me to buy three other books and get it with the rebates than it would have been to buy it alone. Now I just have to get it to the top of my to read pile. Oh, and I have a bone to pick with you mine host! Now my daughter is feeling sick – and I didn’t say anything about yours. Luckily her mother is bringing some sushi home from work so she’ll have a treat later. I find a lot of science fiction these days unpalatable, because I cannot bring myself to believe in the Technological Singularity. It smells like a cargo cult to me. I also believe that self-replicating nanotechnology is no more efficient than self-replicating biotechnology (i.e. bacteria and viruses) if it’s even possible, and that it’s still an open question of whether machine sentience is possible at all at this stage. So the presence of the Technological Singularity immediately jolts my suspension of disbelief. Unfortunately the idea of the Technological Singularity seems to be regarded as a given by many science fiction authors these days. Oh well, there are still authors who don’t kneel before the altars of Kurzweil and Vinge. Sorry to hear Athena is sick, John – I hope she gets well soon. Interesting. This could be fascinating if the author elects to play it straight, or a ghastly piece of easily predictable hackwork if the author follows the typical SF writer habit of condemning the Very Bad Evil of Religion while preaching the Mystic Wonders of Science… while parasitically leveraging an identifiably religious morality. The comment about the necessity for developing alternative moral frameworks tends to indicate the former, so I’ll have to check it out. Nice to see Swann getting some press. Just read his Dragons of the Cuyahoga and Dwarves of Whiskey Island — both sort of noir-detective contemporary fantasy, both set in Cleveland, and both wholly entertaining. I’d be curious how non-Clevelanders enjoyed them, though…Swann seems to have almost too much familiarity with the city. But I found them a blast. Er, that last comment was mine, BTW. Apparently I logged into OpenID somehow. I find a lot of science fiction these days unpalatable, because I cannot bring myself to believe in the Technological Singularity. It smells like a cargo cult to me. I don’t believe in it either. That doesn’t make books that include it bad. I don’t believe it very likely that faster-than-light travel is even theoretically possible, but I’m still happy to read books that include FTL. Don’t read science fiction as a prediction of the future: it’ll be wrong, and almost any author worth reading understands that they’ll be wrong. It’s just an exploration for a concept, not a manifesto for How The Future Will Be.